The XTZ Room Analyzer is a very simple-to-use tool for improving the low-frequency response of your room and system. Out of the box comes a neat and solid USB soundcard, a poseable microphone and an assortment of leads. There's no software in the box – you have to go and download it from the website (www.xtz.se). Once connected to your AV system and a laptop or PC (XTZ recommends Windows XP), follow the onscreen instructions, place the mic at the given positions and press go. The unit will then generate a tone through your system, analyse it and then produce a graph showing the measured room response as it is – and what it could be if the suggested settings are implemented. Planned upgrade releases include an RT60 reverb calculator and SPL function. 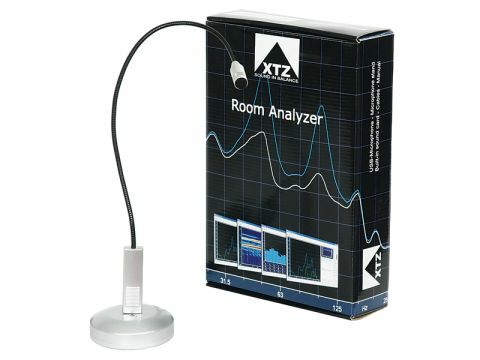 As a tool for analysing your room and to tweak your system, the XTZ Room Analyzer can't be faulted. There's no need to get an expert in if you can read the manual and follow instructions. The generated results are clear and easy to read. Long cables are supplied, so even large rooms can be tackled. A real-time analysis function is included, most useful for EQ tweaking from 16hz-20khz making it relatively easy to achieve a good improvement in system sound. However, it's no substitute for proper room treatments like absorption or diffusion panels.